Wedding! Crown Princes Victoria, of Sweden, will get married June 19th! Which is the 34th anniversary of her parents, King Carl XVI Gustaf and Queen Silvia. It's very exciting. A lot of people remember when Princess Diana and Prince Charles got married. This is the same thing, to Swedes. 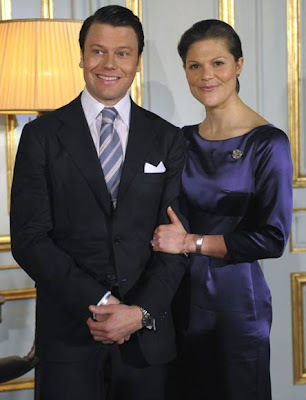 Princess Victoria will become queen of Sweden and she is marrying a regular old guy! Daniel Wessling, a lawyer! I love Princess Victoria. I think she is beautiful, in a very modest way. She is a spitting image of her mother Queen Silvia. When she speaks, she sounds very smart, educated and classy, but is very open with her problems, such as dealing with anorexia and dyslexia. Here they have all kinds of stuff to buy for the wedding. Towels with their pictures on it, playing cards, shot glasses, wine glasses, table runners, candles, the list goes on. All decorated with the royal crown of Sweden. They are also having a lot of wedding shows and movies on TV, in anticipation for the wedding. The Swedish thing of the day is Swedish pie. They don't make it with the crust on top. Always this mixture of cinnamon, flour, butter and vanilla powder. It's reallly good. Last weekend was mothers day here, and Fredrik's sister, Maria, made 3 different pies! It was wonderful! This pie was raspberry (hallon) and rhubard (rabarber). The Swedish word of the day is "väntar" which means "waiting" and is pronounced "ventar". She is a classic beauty. I can't wait to see photos of the wedding! The rhubarb pie looks really good. I have not made it with raspberry. It is traditionally done with strawberry but my favorite is Blubarb Pie made with blueberries! It is so pretty and so good!